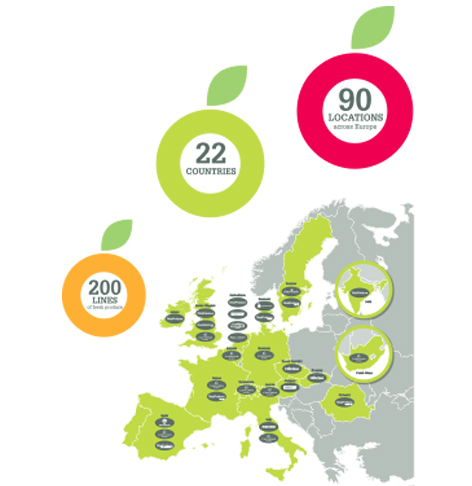 Total Produce is Europe’s premier fresh fruit provider distributing over 250 million cartons of fresh fruits, vegetables and flowers across 90 countries annually. While traditional for logistic based operations such as this to be less marketing focused, Total Produce is at the forefront of creating brands that consumers across Europe engage with. 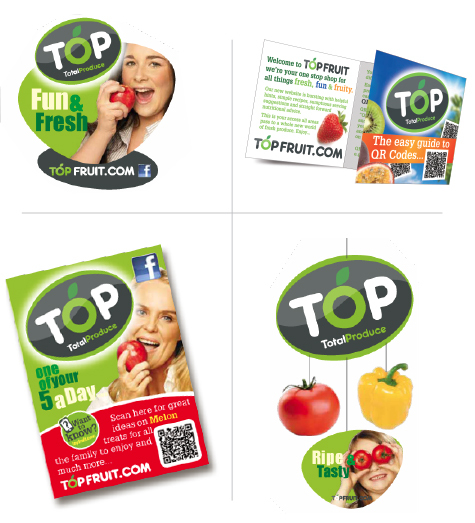 We were engaged to come on board as partners with Total Produce to reposition their ‘Top’ brand, creating a brand with energy and vision, placing consumers at its core. In a sector dominated by own brand Top is injecting new vitality and oomph into an otherwise generic sector. 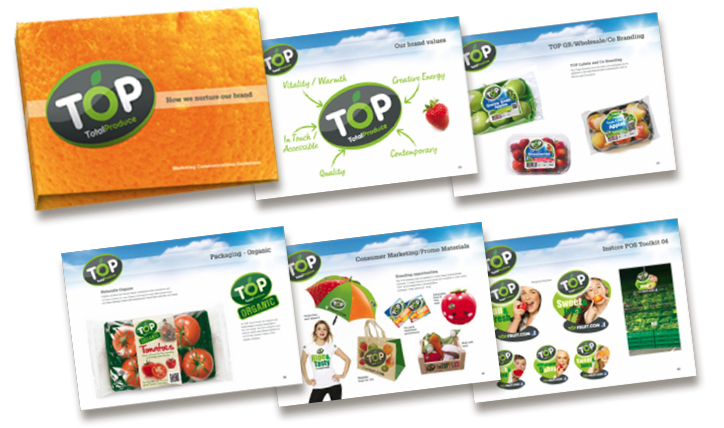 Following a review of the market and requirements for the brand, the new ‘Top’ needed to communicate key attributes: vitality, freshness, healthy, fun, accessible. Functionally the new identity needed to be highly flexible and easy adapted across a vast range of uses. Making sense of the different fruit and veg sectors and seasons was also important as this allows us to communicate on a deeper level with consumers. Visual triggers for exotic fruits clearly differs to those of vegetables, Organic produce to that of tropical, while all sitting under the one umbrella of Top. The new identity is dynamic yet simple. With strong use of colour and typography the identity sits comfortably on its own, alongside sub brands and across a wide range of packaging formats. The visual impact instore is immediately obvious, creating a visual order to the sector, helping consumers navigate far easier. Dunnes have come on board and have co-branded with TOP across their produce. An integrated POS was devised, creating new platforms to engage and interact with consumers, both at store level and through digital media. On line video demonstrations, recipe ideas, product and lifestyle information was put within easy reach through QR coding on packaging and POS, with easy guides on how to use QR codes designed. An extensive range of POS was also created along with point of sale toolkits to ensure consistency at store to store level. A new photographic library was also commissioned to create imagery for use across packaging, marketing communications, POS, etc. 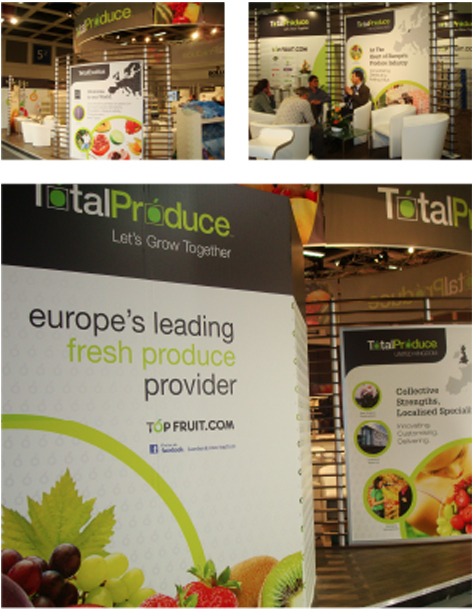 Fruit Logistica Berlin Exhibition stand, where Total Produce are key exhibitor. Protecting this investment in the brand through a brand manual was essential, ensuring consistency of use, maintaining a marketing memory of all the resources available.